Toni Elias didn’t know what it was like to lose the series opener and Cameron Beaubier didn’t know what it was like to win one. Now they both know. 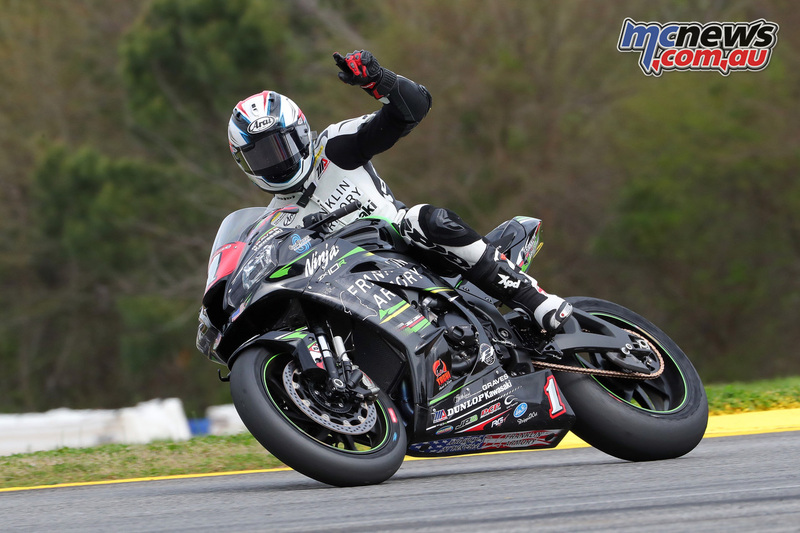 Beaubier beat Elias by 2.732 seconds today at Michelin Raceway Road Atlanta, the Californian ending Elias’ perfect streak of winning every season opener since the Spaniard came to the MotoAmerica Series in 2016. 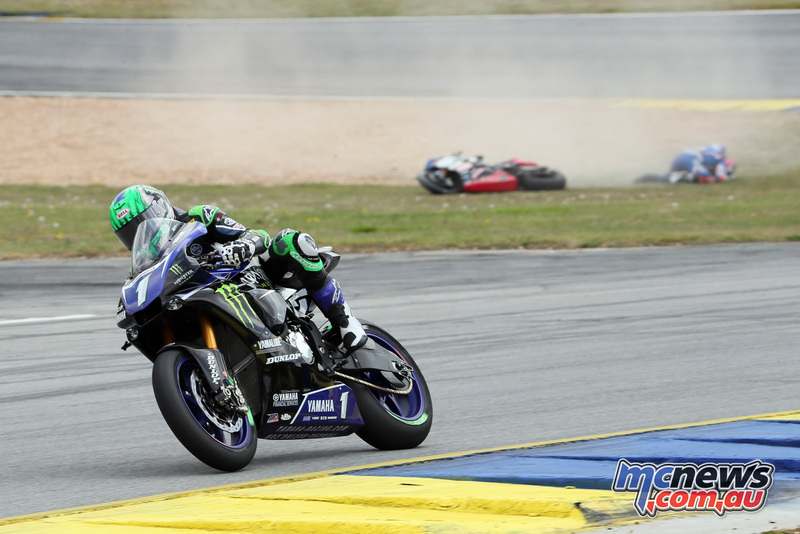 Beaubier was happy to start the season so well, given that it’s not the norm. 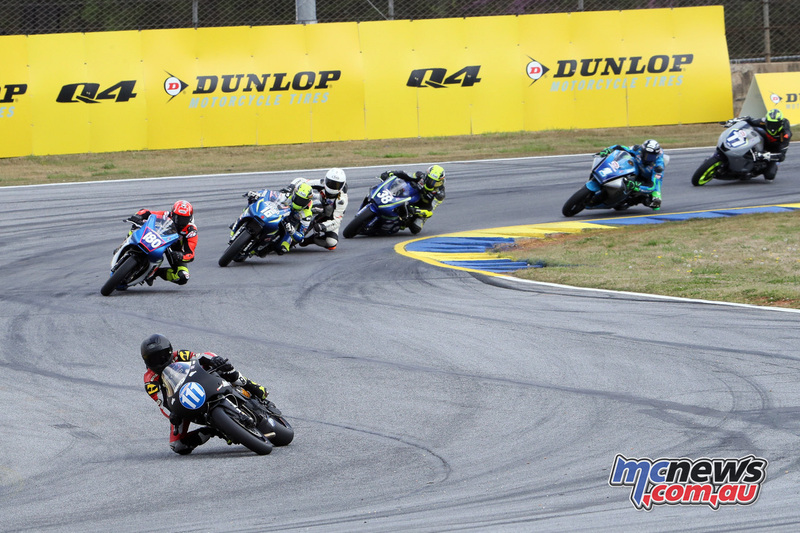 The first EBC Brakes Superbike race was everything we thought it would be with six riders fighting at the front until two of the front runners crashed out. Pole sitter Garrett Gerloff crashed on the third lap while battling for the lead and Josh Herrin followed suit on the 11th lap while also battling at the front. That left four to battle with JD Beach and Mathew Scholtz in the fight at the front with Beaubier and Elias. The battle for victory would come down to Beaubier vs. Elias with Elias running off track in the final corner with four laps to go, handing the win to his rival. The miscue dropped Elias to fourth, but he battled back to finish second, passing Beach right at the finish line. Elias thought the Yoshimura Suzuki teammates would have been better off not racing each other and slowing each other down. Beach may have been beaten at the line by Elias, but it was still his first-ever Superbike podium in his MotoAmerica Superbike debut. 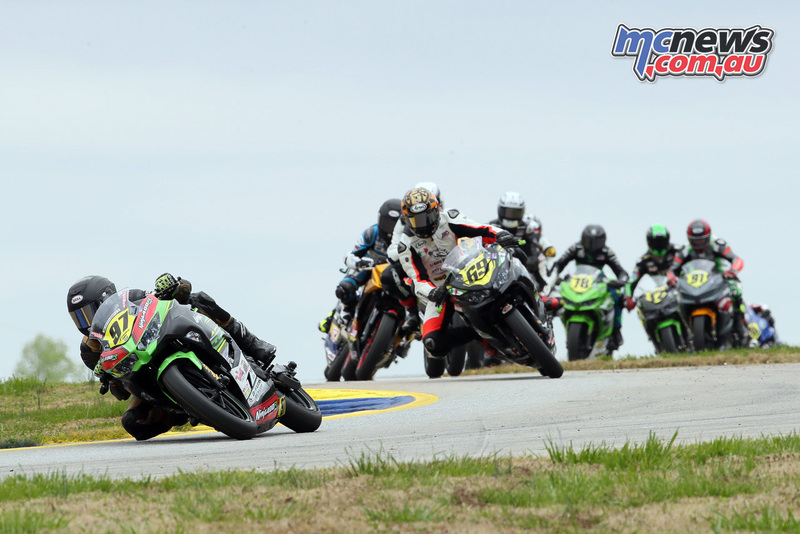 Scholtz ended up fourth, some four seconds behind Beach with David Anthony fifth on his Kawasaki ZX-10R. Kyle Wyman, Jake Lewis, Jake Gagne, Cameron Petersen and Geoff May rounded out the top 10. 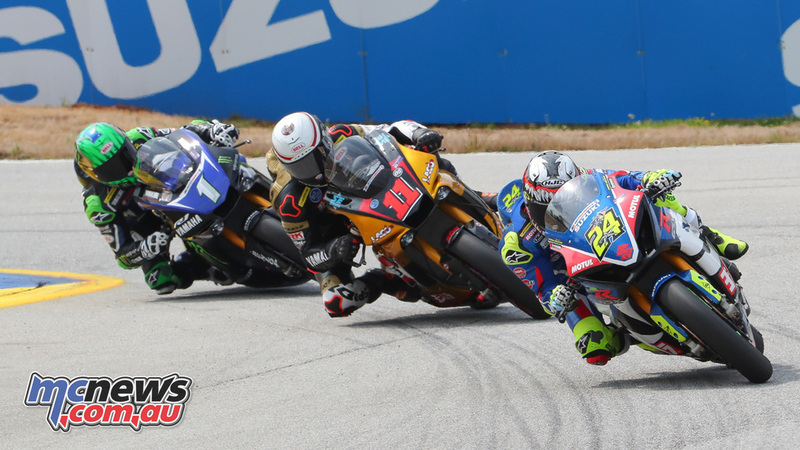 Toni Elias won his first race of the 2019 Series on Sunday, the Spaniard besting Mathew Scholtz by 1.839 seconds under sunny skies in the Suzuki Championship at Michelin Raceway Road Atlanta. The win, combined with his second place from Saturday, gives Elias the early lead in the EBC Brakes Superbike Championship with 45 points – four more than Saturday’s race winner Cameron Beaubier, who was third today. 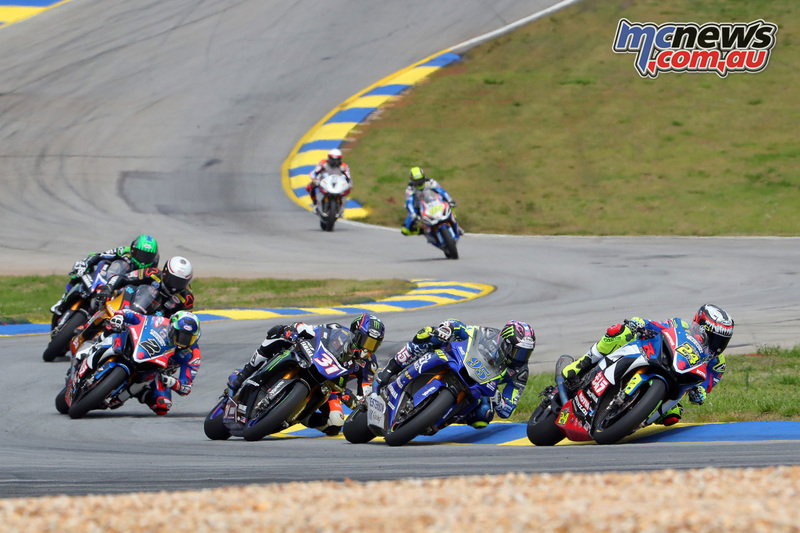 As was the case yesterday, the Superbike race began with six riders running together at the front with those three – Elias, Scholtz and Beaubier – joined by Beaubier’s teammate Garrett Gerloff, JD Beach and Josh Herrin. Scholtz was much happier on Sunday, the South African putting his Yamaha second after fighting with Elias for most of the race. Based on his past results in the season opener, Beaubier was also pleased with how things went over the course of the weekend and he leaves with a solid point score of 41 after a win and third-place finish. Herrin ended up fifth in his second race on the Yoshimura Suzuki, the Georgian having crashed out of Saturday’s race. Jake Lewis was sixth, well behind Herrin and ahead of David Anthony, the team owner rider having a solid weekend with sixth- and seventh-place finishes. Geoff May finished eighth with Gerloff and Cameron Petersen rounding out the top 10. Kyle Wyman and Jake Gagne both failed to finish. Wyman crashed the KWR Ducati and Gagne had mechanical issues with the Scheibe Racing BMW. 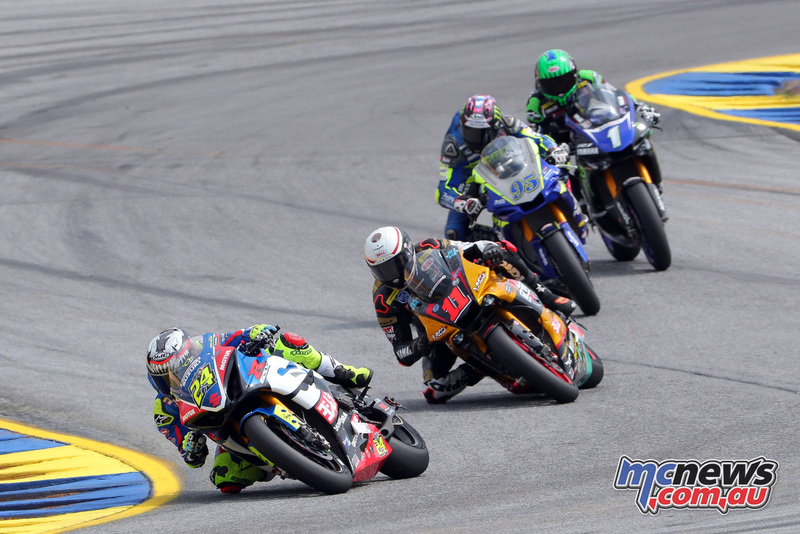 Saturday’s Supersport riders put on quite a show for the fans at Road Atlanta in race one, with polesitter Bobby Fong, who competes for the M4 ECSTAR Suzuki team, having a battle royale with last year’s class championship runner-up Hayden Gillim. 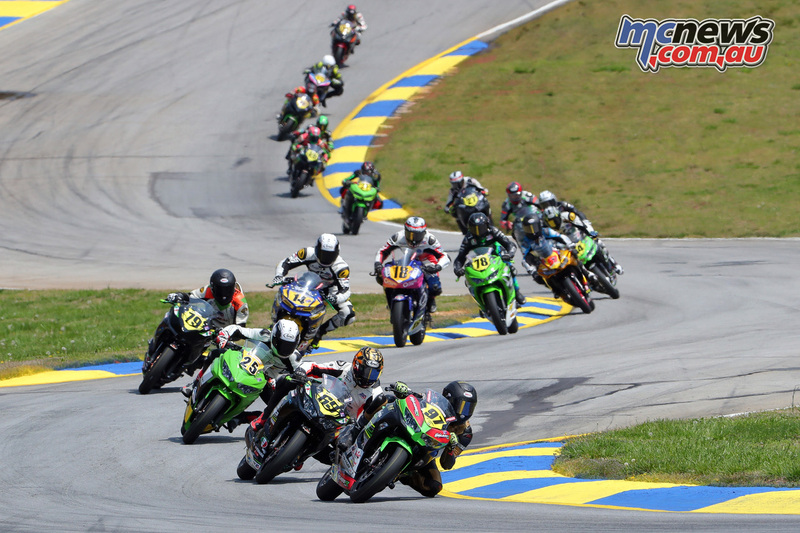 At the start, Fong got the holeshot and Gillim streaked forward from the second row and into second place right on Fong’s tail. The two riders passed and re-passed each other, touched fairings on several occasions, and even used a little bit of “body English” on each other to try to gain an advantage. 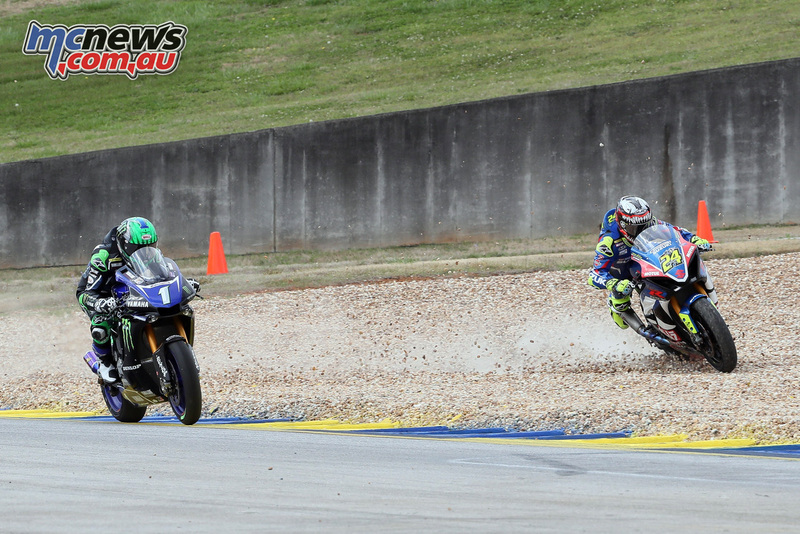 As the race wound down, Fong had a couple of missed shifts, which enabled Gillim to pull a little bit of a gap. At the checkers, Gillim won by a little more than four-and-a-half seconds over Fong. 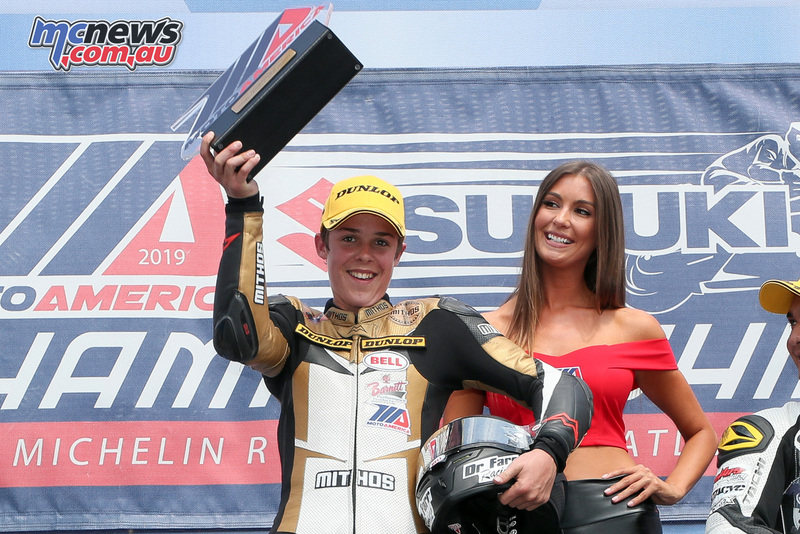 Sixteen-year-old Sean Dylan Kelly, Fong’s M4 ECSTAR Suzuki teammate, finished third in his MotoAmerica debut. In Supersport, Saturday’s second-place finisher Bobby Fong came back strong on Sunday and notched the race win aboard his M4 ECSTAR Suzuki. Second-place finisher PJ Jacobsen kept Fong honest throughout the majority of the 18-lap race to record his first MotoAmerica podium result in his second race aboard his Celtic HSBK Racing Yamaha. Yamaha rider Richie Escalante finished third and dedicated the race to his grandfather after getting the sad news earlier in the day that he had passed away. In Liqui Moly Junior Cup, MotoAmerica’s class with the youngest riders, 14-year-old Rocco Landers took the field to school with a start-to-finish victory in his very first MotoAmerica race. The polesitter, who competes aboard a Landers Racing Kawasaki, got a great jump off the line and pressed his advantage all the way to the checkers to win by more than 16 seconds over Dallas Daniels. 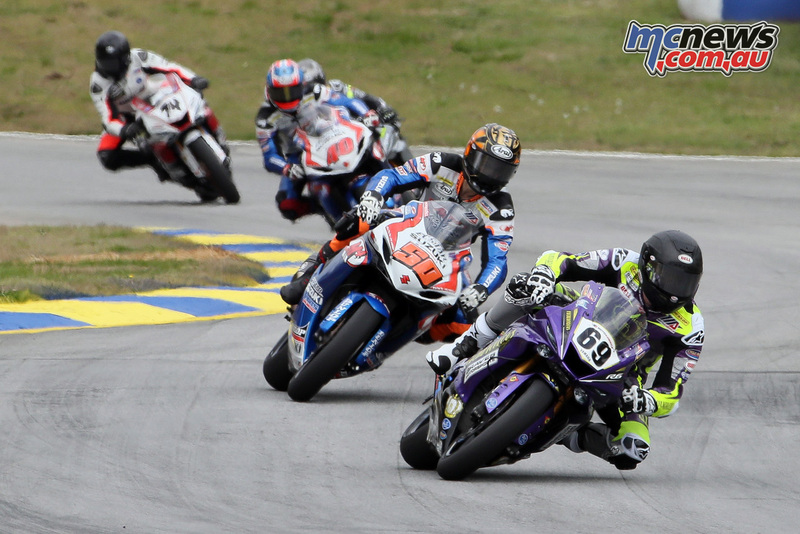 South African Sam Lochoff, who was also making his MotoAmerica debut, finished third aboard his Westby Racing Yamaha. Rocco Landers did the double and took the round win on Sunday. Almost a carbon copy of Saturday, he got a great jump off the line from the pole position, led the 11-lap race from start to finish, and pulled a gap of nearly five seconds. Dallas Daniels, the second-place finisher from Saturday’s race, once again finished second on Sunday. 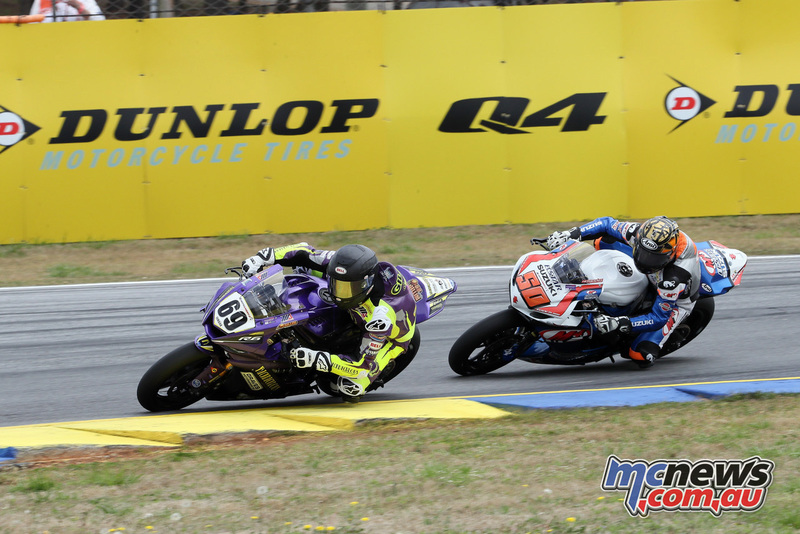 Altus Motorsports rider Kevin Olmedo finished third to complete the podium. Fifty-year-old Michael Barnes, whose motorcycle road racing career has spanned three decades, won the race aboard his Quarterley Racing Ducati. He bested Curtis Murray, who finished second, and 42-year-old defending class champion Chris Parrish. 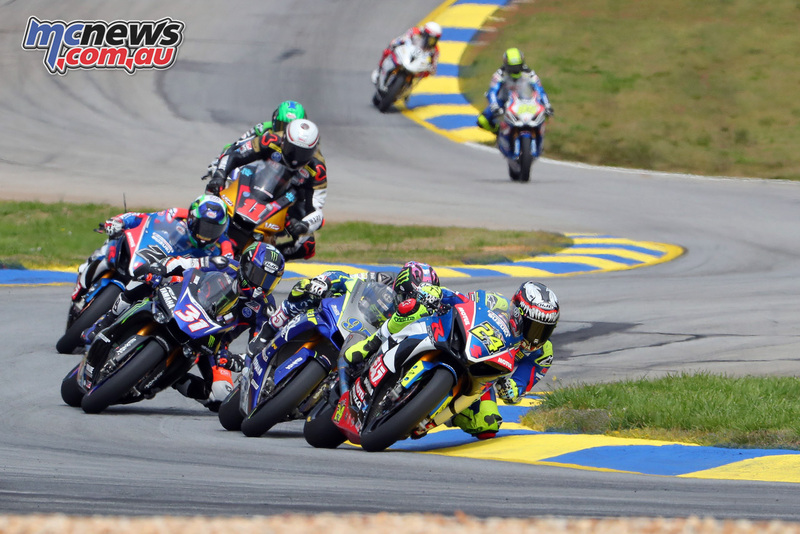 The same podium finishers in Saturday’s Twins Cup race were again on the podium in Sunday’s race, and Quarterley Racing Ducati rider Michael Barnes was the race winner for the second day in a row. Barnes once again showed that experience (age) is the secret to success as he had the measure of his competitors. 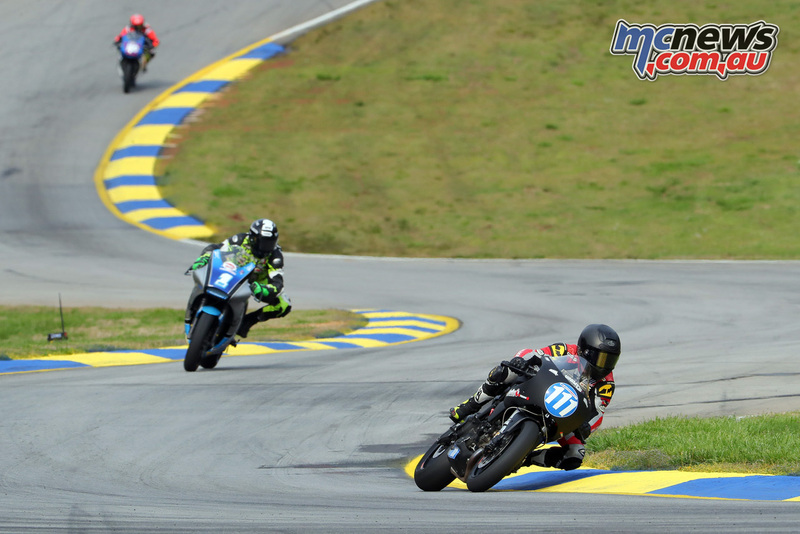 Defending class champ Chris Parrish improved on his Saturday third-place result by finishing second on Sunday aboard his Ghetto Customs Suzuki, and RBoM Racing’s Curtis Murray rounded out the podium in third. 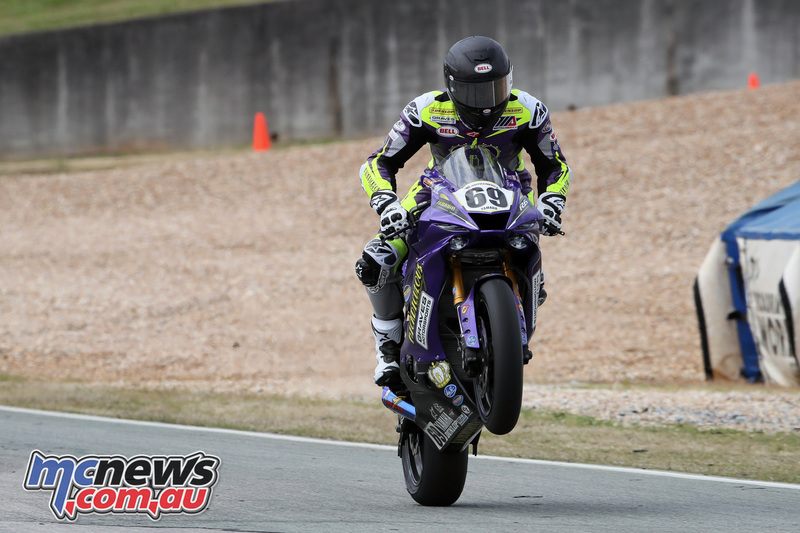 Last year’s Stock 1000 champion Andrew Lee got his 2019 season off to a flying start with a win in Sunday’s race. The Northern Californian is defending his title, stalking second-place finisher Michael Gilbert, who led the majority of the race until Lee made his decisive move and took the checkers. Stefano Mesa came in third, making it a Kawasaki podium sweep. 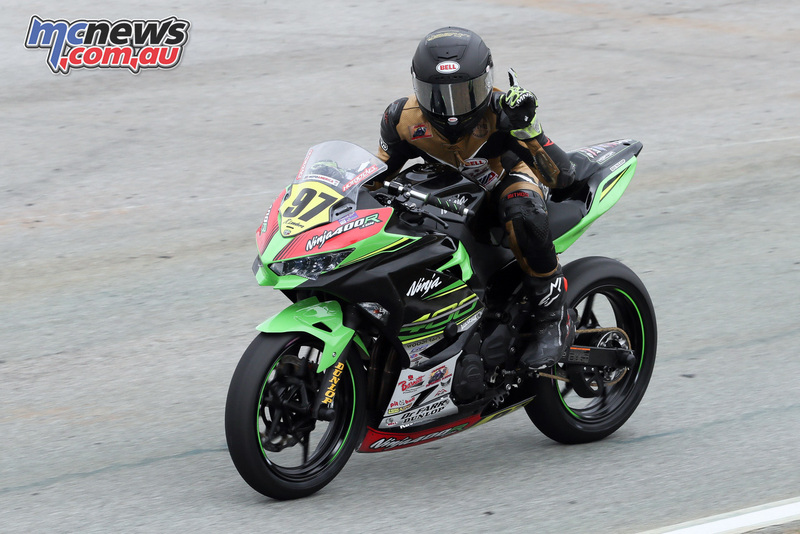 Previous articleBautista makes history at Aragon | Nine in a row!